On Friday, the U.S. Anti-Doping Agency (USADA) informed the UFC that Lesnar had “potentially” violated the anti-doping policy on June 28’s out-of-competition drug test. “The UFC organization was notified today that the U.S. Anti-Doping Agency (USADA) has informed Brock Lesnar of a potential Anti-Doping Policy violation stemming from an out-of-competition sample collection on June 28, 2016. USADA received the testing results from the June 28, 2016 sample collection from the WADA-accredited UCLA Olympic Analytical Laboratory on the evening of July 14, 2016,” UFC expressed in a press release. It is currently unknown what banned substance(s) was discovered in Lesnar’s system. Hunt didn’t appreciate the fact Lesnar was granted an exemption from the UFC and USADA, the third-party company the UFC hired last July to conduct year-round drug tests on their entire roster, regarding a fighter’s four-month holding period after announcing his return to MMA. Although Lesnar and the UFC were in negotiations for his return for months, he didn’t put pen to paper until June 3 so the UFC exercised the fine print in the USADA policy that allowed them to grant Lesnar an exception to the four-month rule. Lesnar was enrolled in the USADA drug testing program three days later and was screened at least five times within the following two weeks. After catching wind of Hunt’s accusations, Lesnar laughed it off because it’s something he’s had to deal with his entire life. 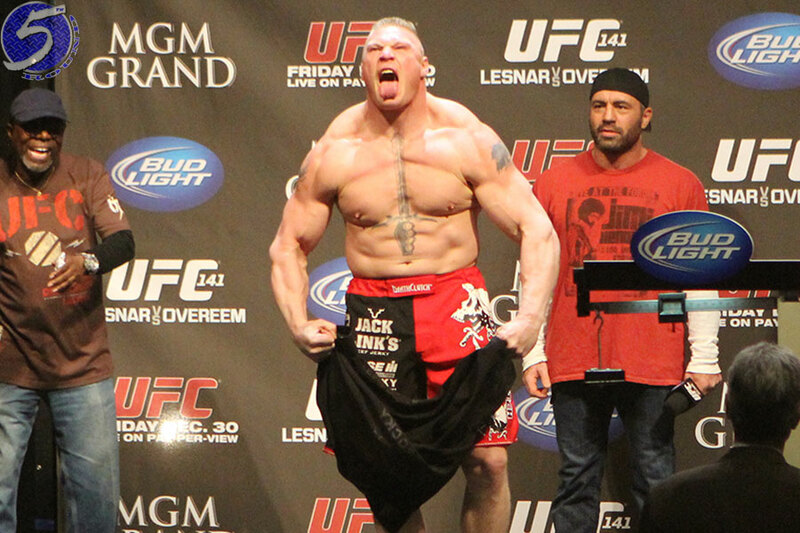 This marks Lesnar’s first flunked drug test in MMA. If found guilty, Lesnar would be banned at least two years from the date of his positive test on June 28. However, that suspension might be a moot point because the WWE loaned Lesnar to the UFC as a “one-off” to headline the historic show. Lesnar would also be fined and have his unanimous decision victory over Hunt overturned to a no contest. Lesnar initially hung up his MMA gloves after getting TKO’d by Alistair Overeem over four years ago at UFC 141. He left the game with a 5-3 professional record, with all but one of his scraps coming inside the big leagues. Four of his seven UFC fights were of the championship variety. Lesnar made a UFC-record $2.5 million for his UFC return. That does not include the millions more that the 39-year-old will pocket after receiving his piece of UFC 200’s pay-per-view pie. UFC 200 took place July 9 inside T-Mobile Arena in Las Vegas, Nevada.